For anyone that loves foil, this is a must have tool to use in your cutter. 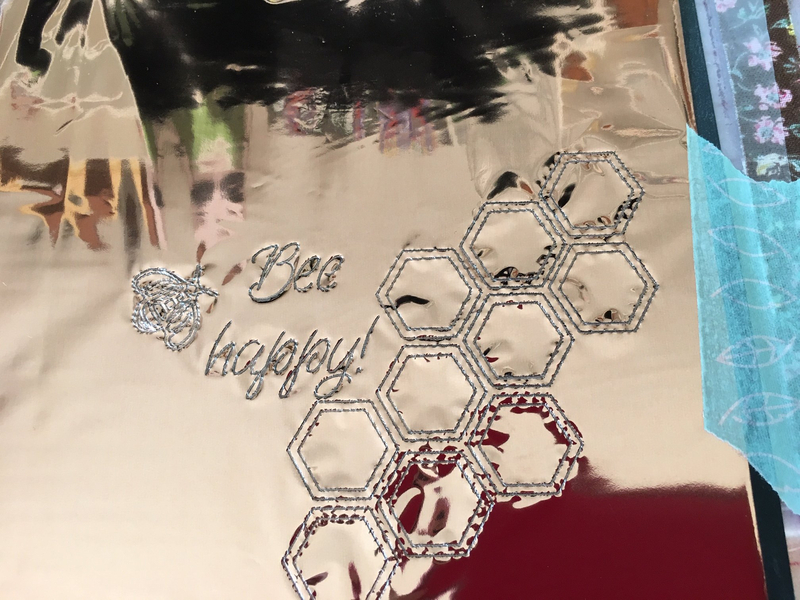 It comes with 4 adapters that will fit pretty much any of the popular cutters, with specific ones for Cricut, Silhouette, SNC and Sizzix. Of those four, one of them is bound to work in any of the other popular cutters, KNK, Silver Bullet, etc. I used the D adapter in the right side of my KNK Force. The kit comes with 3 quills, regular (I like to think of it as a fine tip), medium and heavier tip. I used the fine tip on the projects above, the one on the left was my first test, and I did it on a piece of scrap paper out of my scraps bin. The paper is AC smooth black. 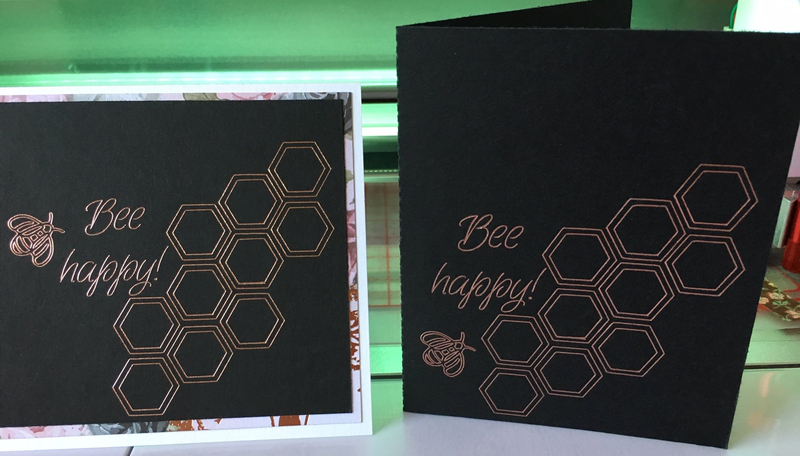 - the honeycomb is part of a free svg file from free single line design over at sofontsy.com - snag it while it's still free. I was a little concerned because it looked like I was going to get a messy result! But nope, once you remove the foil, the results were overwhelmingly crisp. I did use a soft brush to remove flakes of foil that wanted to stick statically to my paper. This pic is before brushing the extra flecks away. Supply of the Foil Quill is hit and miss...I had first ordered from a UK online shop as there wasn't anything left in the US that would ship to me without charging a horrendous price, and believe it or not the shipping cost from the UK to Canada was surprising low!! As of right now, that order is still in a status of allocating. The one I got actually arrived on Friday at my local scrapbooking store, and they called at 5:00 pm Friday. I had it in my hands at 5:15 pm, LOL! The other pre-order will be cancelled. Glad you finally got hold a foil quill pen set and got a chance to play Liz. After my initial playing with mine, I can see why so many people are wanting them. 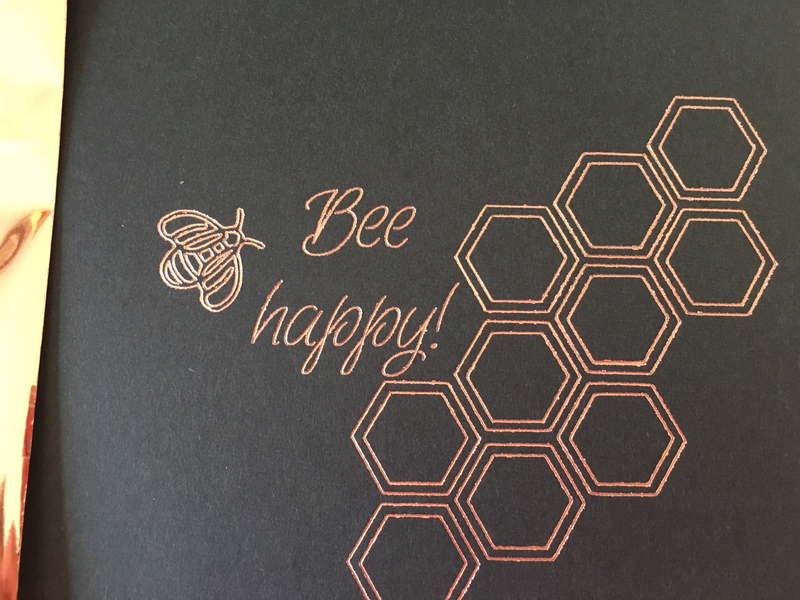 I love your "Bee Happy" design. Thanks for sharing. @MeFlick - thank YOU! Yes it was definitely torture watching everyone make lovely designs using their Foil Quill and I didn't have one!! Sure is a lot of fun. It does have its steps though, and things to remember to do before sending to the cutter, LOL! So adorable! Love that you finally were able to get your Foil Quill. This is great! Thanks for sharing the links.